Cubs center fielder Kosuke Fukudome is quietly putting together a very solid year. As May is closing out tomorrow, his .311 batting average and .441 on-base percentage illustrate the rebound he is making from a horrible second half of 2008. Kosuke is hanging in better on pitches, getting plenty of walks, but most importantly he is driving the ball consistently. 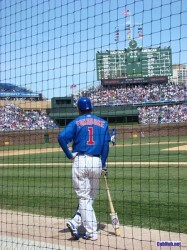 Fukudome is tied for second on the team in both doubles and home runs. This is all in stark contrast to the player that road his average down 100 points from May 1-Sept 30 last season to finish 2008 with a .257 average. The Cubs brass was concerned enough about Kosuke’s ability to adjust to America and the Major Leagues, the season opened with him in a CF platoon with Reed Johnson and Milton Bradley signed to play his natural RF position. In fact, a case could be made that Fukudome’s struggles at the plate and his lack of adjustment to the league is what led to Mark DeRosa being sent packing. Hendry was so concerned about Kosuke’s lack of production, he couldn’t count on him as an everyday player. So he had to go get Bradley but needed to clear payroll to sign him and DeRosa was the odd man out. So I think it is fair to consider the choice was between Fukudome and DeRosa “lost” in no small part due to his value in the market. I’m glad to see Kosuke producing. This team needs his steady bat and superior defense. He is not the superstar player that broke in to MLB with a bang last spring, but so far in 2009, you really couldn’t have asked for more.